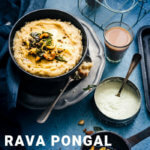 SouthIndian Rava pongal is made with Semonlina and Moong Dal,tempered with curry leaves, cashewnuts, cumin seeds, ginger, green chillies and pepper. Dry Roast Moong Dal in a pan until the color begins to change slightly and its fragrant.Set it aside. Wash the Dal. Cook the Dal with 1 Cup of water in a pressure cooker for 10 minutes and set it aside. Allow the pressure to release naturally. Whisk the Dal until smooth and set it aside. Dry Roast the Semolina in low flame until fragrant. Do not let the Rava turn brown. Set it aside. Heat Oil + Ghee in a pan. Add Cashewnuts and fry in low flame until they are slightly browned. Add cumin, black pepper, asafoetida, ginger, curry leaves, green chilli and allow the cumin to crackle. Add 2 1/4 Cup of Hot water to the Pan and slowly add semolina and stir continuously. When the Semolina is cooked well and all the water is absorbed, add the cooked moong dal mixture & salt. Stir Well. Continue to cook for another 2 minutes until the rava pongal mixture is well blended. If you enjoy, temper again just before serving the Rava Pongal with coconut chutney.